Three years after the dev­as­tat­ing earth­quake that took 300,000 lives and left over one mil­lion Haitians home­less, we assess the wan­ing inter­na­tional response to the ongo­ing human­i­tar­ian cri­sis in the hemisphere’s poor­est coun­try with author Amy Wilentz, who has writ­ten a num­ber of books about Haiti includ­ing her lat­est, Farewell Fred Voodoo: A Let­ter From Haiti. Join­ing her is Haitian-born doc­tor Henri Ford and Hait­ian human rights attor­ney Mario Joseph. Ford is chief of surgery at Children’s Hos­pi­tal Los Ange­les and vice dean for Med­ical Edu­ca­tion at the Keck School of Med­i­cine at USC. 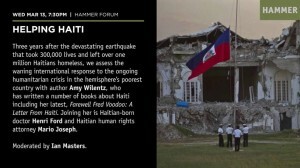 Fol­low­ing the 2010 earth­quake, Dr. Ford returned to Haiti to pro­vide med­ical assis­tance to earth­quake vic­tims. Joseph leads the Bureau des Avo­cats Inter­na­tionaux (BAI) in Port-au-Prince, which rep­re­sents polit­i­cal pris­on­ers, poor peo­ple, and vic­tims of polit­i­cal violence. This ongo­ing series of timely, thought-provoking events addresses cur­rent social and polit­i­cal issues. Ham­mer Forum is mod­er­ated by Ian Mas­ters, jour­nal­ist, author, screen­writer, doc­u­men­tary film­maker, and host of the radio pro­gramsBack­ground Brief­ing, Sun­days at 11AM, and The Daily Brief­ing, Mon­day through Thurs­day at 5PM, on KPFK 90.7 FM. ALL HAMMER PUBLIC PROGRAMS ARE FREE. Ham­mer mem­bers receive pri­or­ity seat­ing, sub­ject to avail­abil­ity. Reser­va­tions not accepted, RSVPs not required. Park­ing is avail­able under the museum for $3 after 6:00pm, bikes park for free and many pub­lic tran­sit lines run directly to the museum. Please see the HAMMER web­site for more information.